Delivery service app Rappi has come under fire in recent weeks as their riders demand better wages and rights. But in spite of receiving $392 million in funding, this startup unicorn still isn’t profitable. “We have a long-term vision and to do that we need to invest a lot. We invest in technology, and expansion … We are taking our time and that’s why Rappi isn’t profitable,” co-founder Sebastian Mejia told RCN Radio. A lack of profit has not stopped them attracting investment. Rappi has successfully passed eight rounds of funding, attracting some big-name investors from the US, Hong Kong, and Germany. They raised $200 million during their last funding round and have now expanded to 33 cities in seven countries. We spoke to several Rappi workers (Rappitenderos in Spanish) who were mostly Venezuelan immigrants living in Barrio Rubio, next to Alto Chapinero. They said that although things had improved, working conditions and benefits could be better. “The only benefit you receive with Rappi is accident insurance, but not health,” said Johan Barón, a Colombian who was raised in Venezuela and returned to Colombia two years ago. “At least they pay you,” he added. “I used to work in construction and sometimes they would withhold our salaries,” he added. Barón said he works from 9am to 1am, leaving his bicycle in a parqueadero down the street from his neighborhood. 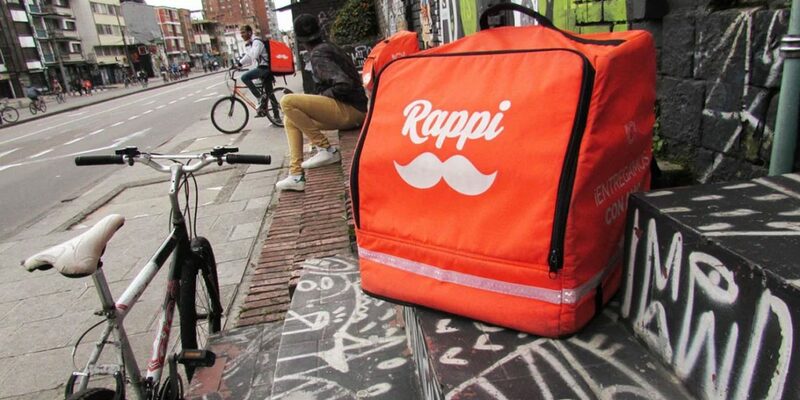 Rappi was founded in 2015 by millenials Simón Borrero, Sebastián Mejía, and Felipe Villamarin, who had the idea to pass out free donuts to those who downloaded the app. In Colombia, the app has now become synonymous with food delivery: couriers in neon orange caps ubiquitous square backpacks race through rush hour traffic on their bicycles and scooters. The company, which started out delivering just food and liquor, has blossomed into a unique same-day delivery system for everything: from restaurant food and groceries to medicine and money – users can withdraw up to $200 thousand pesos at a time, making it a unique competitor to Amazon. Rappi makes money by charging the merchants commission for each order. Rappitenderos don’t receive any of this cash; they are paid by the delivery fee charged to customers. According to Rappi, a delivery person makes around $4,700 pesos for each delivery ($3,700 pesos for the delivery and $1.000 tip). But Barón and other Rappitenderos claim these figures are not accurate. “The minimum delivery fee used to be $3,500 but now it is $1,800,” said Barón. “Before, I used to make $50,000 peos with 10 deliveries, now I have to do 15 to make the same amount of money.,” said Venzuelan Rappitendero Eduardo Sanchéz, 24. Like their riders in rush hour traffic, the company shows no sign of slowing down, aiming to have a Rappitendero on “every corner in the large and medium-sized cities of Latin America,” Rappi CEO and Co-founder Borrero said in an interview. Time will tell whether those Rappitenderos share their CEO’s vision.